Car covers play major role in protecting and safeguarding the outer part of cars against damaging elements. Most of them are built to work perfectly in a selected season such as the winter, summer, and others. But, there are also some that are built considering protection of cars in all seasons of the year. This post is made to provide you information on top 5 folding car covers reviews on the market you need to know. Through the content of this post, you are going to find the right kind folding car cover that will meet your needs. The sensitive part of your car will need proper cover during the harsh winter or summer weather. To ensure absolute coverage and protection of those sensitive parts of your car you need a good car cover. Also, to give you better opportunity to store the car cover without covering your space, you need the foldable one. That is why you should consider going for the AUDEW Car Cover. It is quite uncomplicated to be used. Also, it offers added cotton protection of car body from all kinds of harsh and damaging elements. The flexibility and light on budget associated with this car cover has given it place on this list. This is one of the inexpensive yet great car covers you can easily find in the market. It is not just workable but extremely reliable. This is built to help in protecting cars against any elements. Another thing about this car tent is that it is highly versatile. That means it can be used on different kinds of cars. You can always get this great car cover when you search around in the market. Another thing about this car cover is that it is foldable making it the choice for those that do not have much storage space. 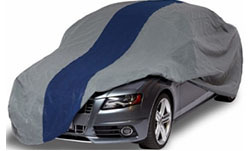 This can be used indoor and outdoor as opposed to most traditional car covers in the market. That is what made it one of the best you can ever find in the market. If what you are looking for is a car cover with heat-resistant as well as waterproof functionality then, you should go for weather proof car cover. This is one of those car covers built with high quality reliable materials. They are built to protect car from different kinds of weather conditions. This cover is also affordable when compared with others and the features they are made of. On top of that, it is foldable giving it space in the list of top folding car covers in the market. That is what made it important for you to consider making use of this car cover for your vehicle. Also, the material is suitable to protect car during winter, summer and other extreme weather conditions. 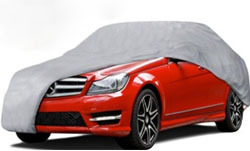 So, your car is protected completely with the help of this wonderfully designed weather proof car cover. Do you want your car to remain brand new even after you have used it for many years? Are you trying to avoid scrapping ice from your car every morning during this winter season? 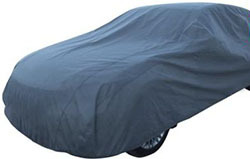 Then, you need not to bother yourself for any reason as the Duck Covers Double Defender Car Cover is the best you need. This is stylishly designed with best quality material. It is also built with heat resisting and waterproof material. 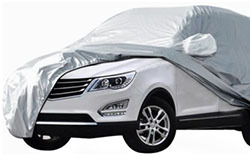 That means you will not even need to worry whether summer or winter when you have this wonderful car cover. Your car will remain like brand new when you start covering it with this designed and affordable car cover. Are you looking around for all-in-one car cover with foldable functionality? The Lanmodo car cover is the choice you should consider making. This is the best quality automatic car cover with foldable design. This car cover is built with multipurpose functionality. It can protect your car from bird droppings, acid rain, winter ice, snow, leaves and even hail and others. The automatic functionality is what gave it the ease of use functionality it is made with. It is easy to apply and available for all cars including sedan, hatchback, wagon, minivan and others. It is also suitable for outdoor time with family. Unlike the heavy car cover, Lanmodo is built completely with lightweight material.